I've made no secret of the fact that recently, my obsession has been big hair. The bigger hair that I can get, the better. For that reason I am willing to try anything to keep it high when I've spent hours in rollers. 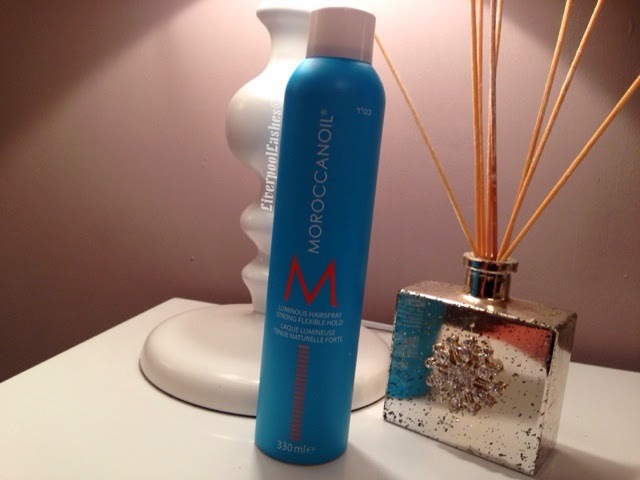 I ordered myself the Moroccanoil Luminous Hairspray Strong Flexible Hold as more of a treat as it's hardly a budget product. I had a quick demonstration of it at an event last summer and I noticed that it didn't leave my hair sticky or crunchy which appealed immensely. The representative also mentioned the treatment side of things that it's meant to do whilst it's holding it in place. It's worth noting that Moroccanoil have two different types of hairspray, Moroccanoil Luminous Hairspray Strong Flexible Hold and Moroccanoil Luminous Hairspray Strong Hold. I went with the 'flexible' version on a whim that I wanted my hair to be flexible so it just sounded better. Perhaps I may buy the other version at some point and see what the difference is. Since I purchased it, I've been using it non stop. I've tried it with just my regular hairstyle and whilst my hair was in rollers and then styled. I've also even applied it to my hair in rollers and then left my hair without brushing it when I removed the rollers to see how it does. The first thing I noticed is the fine airbrush style mist that it gives when you spray it. I like this a lot because it evenly coats your hair. There's nothing worse than spraying a product that distributes like mustard on a hot dog. The next thing I noticed is the scent. The product fragrance is a mix of the classic Moroccanoil and a typical hairspray. As for the hold, hmmmm that's another story. I'm not actually convinced that it has much of a hold. I would say it's more of a natural hold. As I mentioned earlier, I wanted to give the hold a really fair trial so I even went as far as to wear my rollers, spraying the spray, allow it to completely dry and then removing the rollers without brushing my hair at all, but it didn't make it feel like a strong hold. The bottom line is... I would repurchase this hairspray for everyday use to keep my hair in place and help with the shine/overall appearance. I like that it seems to brush out and you really don't seem to be able to spray too much of it. I wouldn't rely on it for times that I want a really strong hold as I just think they've focused their design on it being a fine, non-sticky mist but not so much the strength of it. I do think however, that this hairspray offers a treatment and added additional shine to my hair. I think I would purchase the strong 'non flexible' version when this runs out to trial that and check if there is much difference.